Protesters halted traffic on interstates 80 and 580 at University Avenue for more than two hours Monday during the third night of protests in Berkeley against recent grand jury decisions in the deaths of two unarmed black men. Early Tuesday morning, the California Highway Patrol reported they had arrested more than 150 individuals from that group. The number of protesters peaked at about 1,500 during the demonstration, according to BPD spokesperson Officer Jennifer Coats, as they collectively marched down University Avenue toward the highway. After protesters met a police line at University Avenue and Sixth Street, some protesters splintered off, moving north on 6th Street, while others moved onto the highway. Ten minutes later, the group halted an oncoming Amtrak train near 2nd Street and Addison Street as the group marched toward the interstate. A group of protesters remained at the site, some lying on the tracks in an attempt to stall the train. About 200 protesters then made it onto the freeway and were moving southbound toward the Bay Bridge, weaving around cars in both lanes. Minutes later, after police formed a line instructing protesters to “get off the freeway,” groups of protesters began traveling south along the freeway into Emeryville and then onto Shellmound Street. A police line was formed at Shellmound Street and Ohlone Way. Around this time, a separate group of protesters were encircled by police lines near the Courtyard Marriott hotel and began singing songs, including “Amazing Grace” and “Silent Night” while standing off with police. By 11:30 p.m., interstates 80 and 580 were no longer blocked in the Berkeley-Emeryville area. 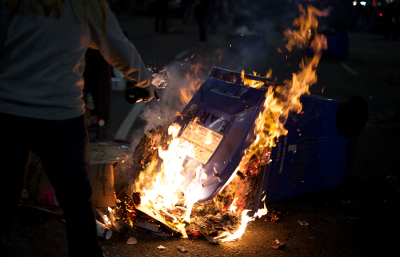 Earlier in the evening, demonstrators had assembled on Upper Sproul Plaza at about 5 p.m., and marched to the dorms near campus, where they swarmed the streets outside Unit 1 and Unit 2, shouting “out of the dorms, into the streets.” Many protesters said there was a strong student presence among the group. After the previous two days of protests — which saw extensive police involvement Saturday and destruction by a few protesters Sunday — demonstrators stressed the need for peace while discouraging looting and vandalism. Demonstrations began Saturday night about 5 p.m. with a crowd of about 40 people and peaked at almost 1,000 at the height of the protest. Protesters initially remained peaceful, staging a “die-in” Downtown and reading the names of those killed by police force. 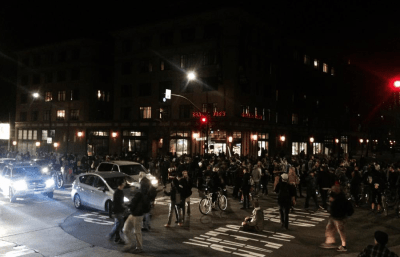 But after a couple hours, police reported officers had been hit by rocks and bricks, and a few members of the crowd vandalized businesses in Downtown Berkeley. After about 10 p.m., officers began using tear gas, releasing multiple rounds of it throughout the night. On Sunday, hundreds of protesters marched from Berkeley to Oakland, where more than 100 of them blocked traffic on Highway 24 until a police line forced them off the highway. When groups returned to Berkeley, a small number of individuals vandalized banks, cellular providers and a few local businesses. Six individuals, including one juvenile, were arrested Saturday night. On Sunday night, five individuals were arrested, according to Coats. Follow the path of the protest below. Before demonstrators gathered early Monday evening, campus officials and several local businesses prepared for protests. Urban Outfitters and several other businesses placed boards over their windows, and some stores closed early. Campus officials recommended that employees leave campus before 5 p.m. if they wanted to get home before the demonstration began. Campus and city officials urged participants to keep the demonstrations peaceful in the wake of the weekend’s protests. “We hope that the anger expressed last night will, in the days ahead, be channeled into constructive, nonviolent action and advocacy that can advance the ongoing fight for justice and equity in our nation,” said Chancellor Nicholas Dirks in a statement Sunday morning. Bates also addressed accusations of “unnecessary force” by police in his statement and said the city will have to complete an impartial review before verifying these claims. Senior staff writers Katy Abbott and Melissa Wen contributed to this report. Staff writers Jessie Lau and Sahil Chinoy also contributed to this report.